The Guidelines trough Procedures of an Ethical Committee for Local Elected Representatives and Officials are results of the need to clarify and interpret in more details the method of work and procedures of the Ethical Committee, and to resolve other issues important for accomplishment of the role of the Ethical Committee related to the implementation of the Model Decision on Ethical Committee for Local Elected Representatives and Officials and to practical reinforcement of provisions of the Code of Ethics. The Guidelines contain of a number of practical justifications, recommendations, advices and guides which can help the Ethical Committees in their work. Ethical Committees are being established for the first time in our local governments. This document can also help all others for whom are expected to contribute to the effective and efficient implementation of the Codes of Ethics in Local Governments, such as public functions’ holders, citizens, media, NGOs and other relevant subjects in local communities. 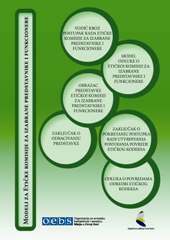 The Guidelines trough Procedures of an Ethical Committee for Local Elected Representatives and Officials were prepared within the framework of the joint project of the Union of Municipalities of Montenegro and the OSCE Mission to Montenegro. The OSCE Mission also financed preparation and publication of the Guidelines.